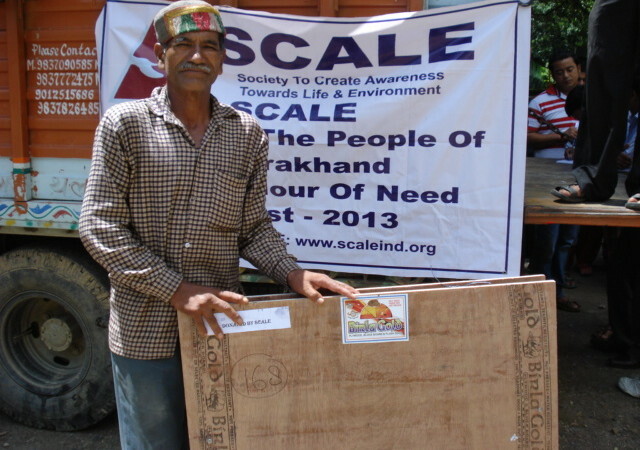 India Development and Relief Fund is putting Uttarakhand villagers on the path to rehabilitation. But their needs are so vast, we can only address them with your generous support. The Himalayan tsunami destroyed thousands of buildings in Pithoragarh District, which borders Nepal and China. Villagers need transitional houses to protect them in the 12+ months it will take to build permanent homes. We have already funded 20 duplex units through Manav Seva Sansthan, a well-established local NGO. But more families are in need. You can provide a durable shelter for 2 families for just $1,300.These homes are sturdy and well-equipped; each family has a main room, kitchen, and toilet. They also receive water purifiers, solar lanterns, and other essentials like heaters. We cannot provide more shelters without your generous contribution. IDRF has already provided 300 good-quality beds & bedding packets to homeless families. Each packet includes a bed, mattress, quilt, sheets, pillows and a mosquito net. Our partner SCALE is a credible organization with more than a decade of local experience. They need ~ 300 more bedding packets; your gift of just $300 will provide ten! A safe warm place to sleep will mean so much. SCALE is also refining a plan to provide solar lanterns to hundreds of families and to train local people as lantern technicians. This project will require tens of thousands of dollars, so please contribute what you can. With 25 years of experience and a development expert on the ground as our consultant, IDRF will use your hard-earned money effectively and responsibly.